The UK has voted to leave the EU - but what does this mean for Ireland? The referendum result will have huge ramifications for Ireland and the rest of the EU. THE UNITED KINGDOM has voted to leave the European Union in an historic referendum result that will have huge ramifications for the rest of Europe and and the world. But what will this mean for Ireland? As one of the United Kingdom’s closest trading partners and – barring France via the Channel Tunnel – the only country to share a border with it, Ireland will undoubtedly be hugely impacted by the result. 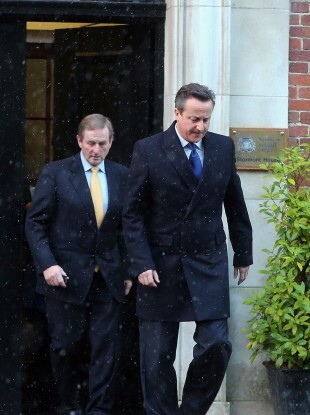 Cabinet will meet this morning to discuss the result and Enda Kenny is expected to make a statement at 11am. Markets opened this morning showing the Irish stock market is down by as much as 13% – signifying just how vulnerable the country is. The latest government analysis (the Summer Economic Statement) showed that a Brexit could potentially knock between €1.1 billion and €2.7 billion off of our GDP. Straight away, it is evident that Irish banks and companies have taken a significant hit – with Bank of Ireland, Ryanair and Permanent TSB all down. As with many aspects of the fallout of the result, only time will tell what the long term impact will be on the Irish economy, but experts are saying that it will likely be negative. "This development is unambiguously negative for the Irish economy" -@pdosullivan of @Investec. Time for clear thinking on challenges ahead. The United Kingdom is Ireland’s second largest trading partner, with 16% of our exports going to the UK. As an island nation, exports are a highly important aspect of our economy. The Brexit could likely throw this relationship into turmoil. This would be felt particularly badly in the agricultural industry – with 52% of Irish beef and 60% of cheese exported to the UK. As negotiations begin between the EU and the UK, the focus will shift onto whether or not the UK will stay part of the European single market – which allows for low tax trade across European countries. Failure to do this would result in the UK reverting to trading with the EU under World Trade Organisation rules – which would mean high taxes for exporters. This could hugely impact Ireland’s trade with the UK and have serious economic repercussions here. The UK is set for years of negotiations with the EU – Fianna Fáil leader Micheál Martin said that it will be vital that Ireland is involved closely in these organisations as we are uniquely positioned to be hugely impacted by the result. Martin said that the situation facing Ireland was “overwhelming”. “The economic, social and political case for Ireland to be a member of the Union remains overwhelming,” he said. Another huge impact here will be on the border between Ireland and Northern Ireland. Sinn Féin has already called for a border-poll in the wake of the result – stating that the UK no longer has a mandate to govern the North. Northern Ireland voted to remain in the EU – so the decision is at odds with the wider UK result. There are also questions mounting over whether this could derail the Peace Process also. Forms of customs checks existed between the two countries right up until 1993 – before they were abolished under European Community rules. Now, there is a chance that checks like these could be reinstated. A common travel area has existed between Ireland and the UK since the 1920s – allowing people to travel between both regions without a passport. As per above, there is a chance this could be in jeopardy following the referendum result. In terms of the border, Enda Kenny has said that the result could see the reinstatement of border controls between the Republic and the North – a situation that would be damaging economically and socially for both countries. While this has been denied by Northern Secretary Theresa Villiers, there is a chance that the Republic could be viewed as a ‘soft entry’ for migrants looking to get into the UK. On top of this, there are tens of thousands of people with Irish passports currently living in the UK. The Brexit negotiations will likely take years, but it unsure at this point what status Irish immigrants in the UK will have following the result. Only time will tell what effects the UK leaving will have on the common travel area agreement between the two countries. Read: Brexit: What happens now? Email “The UK has voted to leave the EU - but what does this mean for Ireland?”. Feedback on “The UK has voted to leave the EU - but what does this mean for Ireland?”.